Wireless networking is a method by which homes, telecommunications networks and enterprise (business) installations avoid the costly process of introducing cables into a building, or as a connection between various equipment locations. Wireless telecommunications networks are generally implemented and administered using radio communication. This implementation takes place at the physical level (layer) of the OSI model network structure. 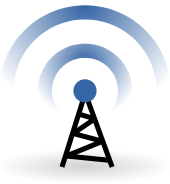 Wireless personal area networks (WPANs) interconnect devices within a relatively small area, that is generally within a person's reach. For example, both Bluetooth radio and invisible infrared light provides a WPAN for interconnecting a headset to a laptop. ZigBee also supports WPAN applications. Wi-Fi PANs are becoming commonplace (2010) as equipment designers start to integrate Wi-Fi into a variety of consumer electronic devices. Intel "My WiFi" and Windows 7 "virtual Wi-Fi" capabilities have made Wi-Fi PANs simpler and easier to set up and configure. A wireless ad hoc network is also known as wireless mesh network or mobile ad hoc network (MANETs). It is a wireless network made up of radio nodes organized in a mesh topology. Each node forwards messages on behalf of the other nodes and each node performs routing. Ad hoc networks can "self-heal", automatically re-routing around a node that has lost power. Various network layer protocols are needed to realize ad hoc mobile networks, such as Distance Sequenced Distance Vector routing, Associativity-Based Routing, Ad hoc on-demand Distance Vector routing, and Dynamic source routing. Each standard varies in geographical range, thus making one standard more ideal than the next depending on what it is one is trying to accomplish with a wireless network. The performance of wireless networks satisfies a variety of applications such as voice and video. The use of this technology also gives room for expansions, such as from 2G to 3G and, most recently, 4G technology, which stands for the fourth generation of cell phone mobile communications standards. As wireless networking has become commonplace, sophistication increases through configuration of network hardware and software, and greater capacity to send and receive larger amounts of data, faster, is achieved. 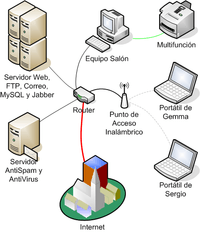 Space is another characteristic of wireless networking. Wireless networks offer many advantages when it comes to difficult-to-wire areas trying to communicate such as across a street or river, a warehouse on the other side of the premises or buildings that are physically separated but operate as one. Wireless networks allow for users to designate a certain space which the network will be able to communicate with other devices through that network. Space is also created in homes as a result of eliminating clutters of wiring. This technology allows for an alternative to installing physical network mediums such as TPs, coaxes, or fiber-optics, which can also be expensive. ↑ "A New Clustering Algorithm for Wireless Sensor Networks" (PDF). ↑ "Wireless Network Industry Report". Retrieved 8 July 2008.